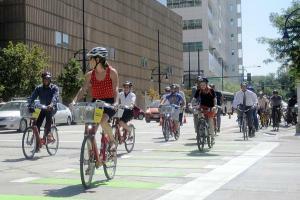 The Denver Post endorses the idea of “protected” bike lanes in downtown Denver as well as other places which can be determined in the future. Calling the protected lane a “marker for our changing culture”, the Post lauds city officials for encouraging healthy activity and for recognizing the growing culture of commuting by bicycle. While only 2.4. percent of Denver residents communte by bike, the figures indicate the trend is growing as Americans are driving less. Another sign of the growth in cycling was the announcement that the Denver B-cycle stations will be open through the winter season. "We have grown to the point where riders depend on the bikes as part of their daily transportation needs ... " said the interim executive director of B-cycle. This year, Denver B-cycle opened 29 new stations, bringing the total to 82 stations with more than 700 bicycles.